Cyanobacteria are tiny, hardy organisms. Each cell is 25 times smaller than a human hair. Their collective ability to do photosynthesis is why we have air to breathe and a diverse and complex biosphere. Scientists are interested in what makes cyanobacteria great at photosynthesis. Some want to isolate and copy successful processes which would then be repurposed for human usage, like in medicine or for renewable energy. One of these processes is photoprotection. It includes a network of proteins that detect surrounding light levels and protect cyanobacteria from damages caused by overexposure to bright light. The lab of Cheryl Kerfeld at Michigan State University recently discovered a family of proteins, the Helical Carotenoid Protein, or HCP, that are the evolutionary ancestors of today’s photoprotective proteins. Although ancient, HCP still live on alongside their modern descendants. This discovery has opened new avenues to explore photoprotection and for the first time, the Kerfeld lab structurally and biophysically characterizes one of these proteins. They call it HCP2. The study is in the journal BBA-Bioenergetics. Structurally, the HCP2 is a monomer when isolated in a solution, but in its crystallized form, it curiously shows up as a dimer. The scientists try to determine HCP2s functions. It is a good quencher of reactive oxygen species, damaging byproducts of photosynthesis. But since many other proteins can do that as well, Dominguez-Martin doesn’t think that is HCP2’s main function. The ability to detect light is key for applications, especially in biotech. One promising area is optogenetics, a technology that uses light to control living cells. Optogenetics systems are like light switches that activate predetermined functions when struck by a light source. HCP2 could play a part in such applications. But this is all far down the road. Because these proteins likely play a role in photoprotection, they may represent a system that scientists could engineer for “smart photoprotection,” reducing wasteful photoprotection which would then help photosynthetic organisms become more efficient. Tags: Astrochemistry ( 5 ), Astronomy ( 7,559 ), Astrophysics ( 4,694 ), Basic Research ( 10,456 ), Cosmology ( 4,885 ), MSU-Michigan State University, Trihydrogen or H3+ is acknowledged by scientists as the molecule that made the universe. Trihydrogen, or H3+, is acknowledged by scientists as the molecule that made the universe. In recent issues of Nature Communications and the Journal of Chemical Physics, Michigan State University researchers employed high-speed lasers to shine a spotlight on the mechanisms that are key in H3+ creation and its unusual chemistry. H3+ is prevalent in the universe, the Milky Way, gas giants and the Earth’s ionosphere. It’s also being created and studied in the lab of Marcos Dantus, University Distinguished Professor in chemistry and physics. Using ultrafast lasers – and technology invented by Dantus – a team of scientists is beginning to understand the chemistry of this iconic molecule. Astrochemists see the big picture, observing H3+ and defining it through an interstellar perspective. It’s created so fast ­– in less time than it takes a bullet to cross an atom – that it is extremely difficult to figure out how three chemical bonds are broken and three new ones are formed in such a short timescale. That’s when chemists using femtosecond lasers come into play. Rather than study the stars using a telescope, Dantus’ team literally looks at the small picture. The entire procedure is viewed at the molecular level and is measured in femtoseconds – 1 millionth of 1 billionth of a second. The process the team views takes between 100 and 240 femtoseconds. Dantus knows this because the clock starts when he fires the first laser pulse. The laser pulse then “sees” what’s happening. The two-laser technique revealed the hydrogen transfer, as well as the hydrogen-roaming chemistry, that’s responsible for H3+ formation. Roaming mechanisms briefly generate a neutral molecule (H2) that stays in the vicinity and extracts a third hydrogen molecule to form H3+. And it turns out there’s more than one way it can happen. In one experiment involving ethanol, the team revealed six potential pathways, confirming four of them. Since laser pulses are comparable to sound waves, Dantus’ team discovered a “tune” that enhances H3+ formation and one that discourages formation. When converting these “shaped” pulses to a slide whistle, successful formation happens when the note starts flats, rises slightly and finishes with a downward, deeper dive. The song is music to the ears of chemists who can envision many potential applications for this breakthrough. This study reveals chemistry that is relevant in terms of the universe’s formation of water and organic molecules. The secrets it could unlock, from astrochemical to medical, are endless, he added. MSU scientists who contributed to the Nature Communications paper included Nagitha Ekanayake, Muath Nairat, Nicholas Weingartz, Benjamin Farris, Benjamin Levine and James Jackson. Researchers from Kansas State University also contributed to this study. 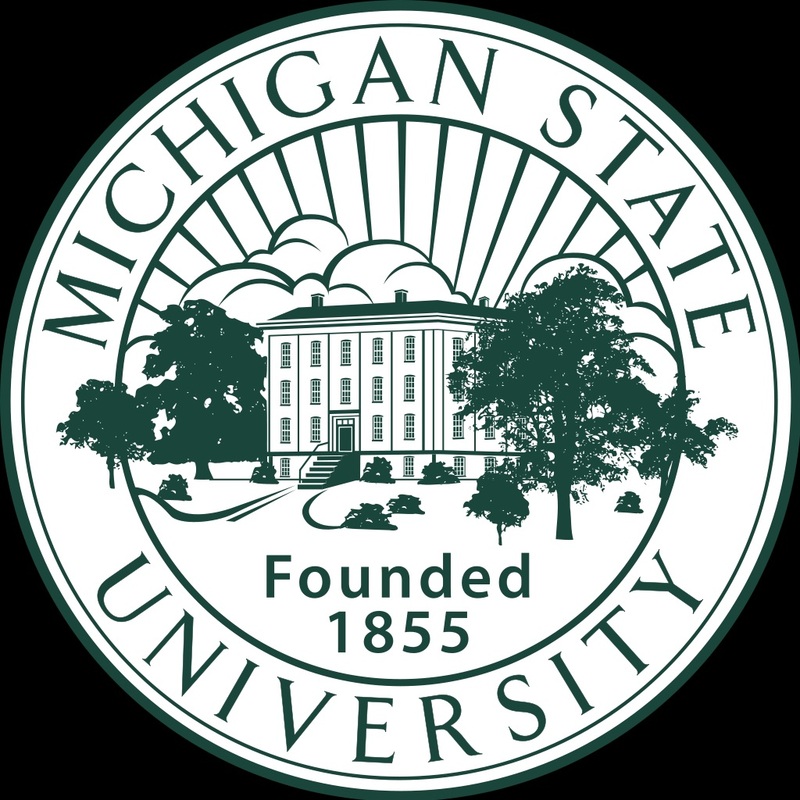 MSU scientists who contributed to the Journal of Chemical Physics paper included Ekanayake, Nairat, Matthew Michie, Weingartz and Levine. This research was funded by the Department of Energy and the National Science Foundation. Discoveries that change our view of the world don’t happen every day. But when they do, they can provide more questions than answers. It takes a lot of additional work to find all the pieces of the new scientific jigsaw puzzle, put them together step by step and eventually arrive at a new understanding. Advanced astronomical observations with modern telescopes continue to reveal more and more secrets hidden in distant stars. State-of-the-art accelerator facilities study the nuclear reactions that create elements in stars. And sophisticated computer models put it all together, trying to recreate the parts of the universe we see, while reaching out toward the ones that are still hiding until the next major discovery. in Japan discovered eight new rare isotopes of the elements phosphorus, sulfur, chlorine, argon, potassium, scandium and, most importantly, calcium. These are the heaviest isotopes of these elements ever found. Isotopes are different forms of elements found in nature. Isotopes of each element contain the same number of protons, but a different number of neutrons. The more neutrons that are added to an element, the “heavier” it is. The heaviest isotope of an element represents the limit of how many neutrons the nucleus can hold. Also, isotopes of the same element have different physical properties. “Stable” isotopes live forever, while some heavy isotopes might only live for a few seconds. Some even heavier ones might barely exist fractions of a second before disintegrating. The most interesting short-lived isotopes synthesized during a recent experiment at RIKEN’s Radioactive Isotope Beam Factory were calcium-59 and calcium-60, which are now the most neutron-laden calcium isotopes known to science. The superconducting ring cyclotron at the Riken Radioactive Isotope Beam Factory (RIBF)—the largest accelerator of its kind in the world. The nucleus of calcium-60 has 20 protons and twice as many neutrons. That’s 12 more neutrons than the heaviest of the stable calcium isotopes, calcium-48. This stable isotope disintegrates after living for hundreds of quintillion years, or 40 trillion times the age of the universe. In contrast, calcium-60 lives for a few thousandths of a second. Proving the existence of a certain isotope of an element can advance scientists’ understanding of the nuclear force – a longstanding quest in nuclear science. “At the heart of an atom, protons and neutrons are held together by the nuclear force, forming the atomic nucleus,” said Oleg Tarasov, a staff physicist at MSU’s National Superconducting Cyclotron Laboratory. 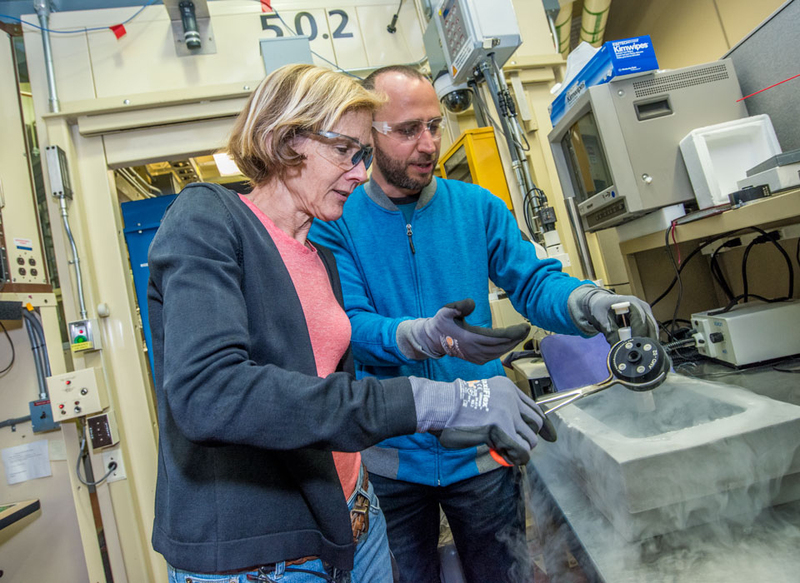 Alexandra Gade, professor of physics at MSU and NSCL chief scientist, is interested in the comparison of the new discoveries to nuclear models. In a way, these models paint a picture of the nucleus at different resolutions. Two of the other new isotopes of sulfur and chlorine, S-49 and Cl-52, were not predicted to exist by a number of models that paint a lower resolution picture of nuclei. Their ingredients can now be refined as well. Creating and identifying rare isotopes is the nuclear-physics version of a formidable needle-in-a-haystack problem. To synthesize these new isotopes, researchers accelerated an intense beam of heavy zinc particles onto a block of beryllium. In the resulting debris of the collision, with a minuscule chance, a rare isotope such as calcium-60 is formed. The intense zinc beam that enabled the discovery of calcium-59 and calcium-60 was provided by the RIBF, which is presently home to the world’s most powerful accelerator facility in the field. The isotopes calcium-57 and 58 were discovered in 2009 at NSCL. In the future, MSU’s Facility for Rare Isotope Beams will allow scientists to potentially make calcium-68 or even calcium-70, which may be the heaviest calcium isotopes. The research was supported by the National Science Foundation and MSU. This research was featured on the cover in the July 11 edition Physical Review Letters and was selected for an Editors’ Suggestion. The National Science Foundation’s National Superconducting Cyclotron Laboratory is a center for nuclear and accelerator science research and education. It is the nation’s premier scientific user facility dedicated to the production and study of rare isotopes. It took a decade and worldwide effort to confirm these last four elements. And now scientists wonder: how far can this table go? Some answers can be found in a recent Nature Physics Perspective by Witek Nazarewicz [link is above], Hannah Distinguished Professor of Physics at MSU and chief scientist at the Facility for Rare Isotope Beams. Mathematical physicist and cosmologist Stephen Hawking was best known for his work exploring the relationship between black holes and quantum physics. A black hole is the remnant of a dying supermassive star that’s fallen into itself; these remnants contract to such a small size that gravity is so strong even light cannot escape from them. Black holes loom large in the popular imagination – schoolchildren ponder why the whole universe doesn’t collapse into one. But Hawking’s careful theoretical work filled in some of the holes in physicists’ knowledge about black holes. Imagine you stand on Earth’s surface, and fire a bullet into the air at an angle. Your standard bullet will come back down, someplace farther away. Suppose you have a very powerful rifle. Then you may be able to shoot the bullet at such a speed that, rather than coming down far away, it will instead “miss” the Earth. Continually falling, and continually missing the surface, the bullet will actually be in an orbit around Earth. If your rifle is even stronger, the bullet may be so fast that it leaves Earth’s gravity altogether. This is essentially what happens when we send rockets to Mars, for example. Now imagine that gravity is much, much stronger. No rifle could accelerate bullets enough to leave that planet, so instead you decide to shoot light. While photons (the particles of light) do not have mass, they are still influenced by gravity, bending their path just as a bullet’s trajectory is bent by gravity. Even the heaviest of planets won’t have gravity strong enough to bend the photon’s path enough to prevent it from escaping. But Hawking discovered that black holes aren’t completely black? My previous description of black holes used the language of classical physics – basically, Newton’s theory applied to light. But the laws of physics are actually more complicated because the universe is more complicated. In classical physics, the word “vacuum” means the total and complete absence of any form of matter or radiation. But in quantum physics, the vacuum is much more interesting, in particular when it is near a black hole. Rather than being empty, the vacuum is teeming with particle-antiparticle pairs that are created fleetingly by the vacuum’s energy, but must annihilate each other shortly thereafter and return their energy to the vacuum. You will find all kinds of particle-antiparticle pairs produced, but the heavier ones occur much more rarely. It’s easiest to produce photon pairs because they have no mass. The photons must always be produced in pairs so they’re moving away from each other and don’t violate the law of momentum conservation. Now there’s a problem: The one photon that moved inside the black hole cannot come back out, because it’s already moving at the speed of light. The photon pair cannot annihilate each other again and pay back their energy to the vacuum that surrounds the black hole. But somebody must pay the piper and this will have to be the black hole itself. After it has welcomed the photon into its land of no return, the black hole must return some of its mass back to the universe: the exact same amount of mass as the energy the pair of photons “borrowed,” according to Einstein’s famous equality E=mc². This is essentially what Hawking showed mathematically. The photon that is leaving the black hole horizon will make it look as if the black hole had a faint glow: the Hawking radiation named after him. At the same time he reasoned that if this happens a lot, for a long time, the black hole might lose so much mass that it could disappear altogether (or more precisely, become visible again). This seems counter to our intuition, where a melon that splattered on the floor would never magically reassemble itself. But what happens to big objects like melons is really dictated by the laws of statistics. For the melon to reassemble itself, many gazillions of atomic particles would have to do the same thing backwards, and the likelihood of that is essentially zero. But for a single particle this is no problem at all. So for atomic things, everything you observe forwards could just as likely occur backwards. Now imagine that you shoot one of two photons into the black hole. They only differ by a marker that we can measure, but that does not affect the energy of the photon (this is called a “polarization”). Let’s call these “left photons” or “right photons.” After the left or right photon crosses the horizon, the black hole changes (it now has more energy), but it changes in the same way whether the left or right photon was absorbed. Some physicists thought that maybe the Hawking radiation carries an imprint of left/right so as to give an outside observer a hint at what the past was, but no. The Hawking radiation comes from that flickering vacuum surrounding the black hole, and has nothing to do with what you throw in. All seems lost, but not so fast. In 1917, Albert Einstein showed that matter (even the vacuum next to matter) actually does react to incoming stuff, in a very peculiar way. The vacuum next to that matter is “tickled” to produce a particle-antiparticle pair that looks like an exact copy of what just came in. In a very real sense, the incoming particle stimulates the matter to create a pair of copies of itself – actually a copy and an anti-copy. Remember, random pairs of particle and antiparticle are created in the vacuum all the time, but the tickled-pairs are not random at all: They look just like the tickler. This copy process is known as the “stimulated emission” effect and is at the origin of all lasers. The Hawking glow of black holes, on the other hand, is just what Einstein called the “spontaneous emission” effect, taking place near a black hole. Now imagine that the tickling creates this copy, so that the left photon tickles a left photon pair, and a right photon gives a right photon pair. Since one partner of the tickled pairs must stay outside the black hole (again from momentum conservation), that particle creates the “memory” that is needed so that information is preserved: One past has only one future, time can be reversed, and the laws of physics are safe. In a cosmic accident, Hawking died on Einstein’s birthday, whose theory of light – it just so happens – saves Hawking’s theory of black holes. Many different nuclear reactions are responsible for making all this happen. And they’re extremely difficult to study in the laboratory because nuclei are hard to fuse. That’s why, for more than six decades, nuclear physicists have continued to work [Physics in Perspective] to get a handle on the nuclear reactions that drive the stars. Very old stars record the composition of the universe way back at the time of their formation. As more and more stars of varying ages are found, their compositions begin to tell the story of element synthesis in our galaxy [Physics Today], from its formation shortly after the Big Bang to today. The most recent example comes from a neutron-star merger event tracked by gravitational and electromagnetic observatories around the world. This observation demonstrates that even merging neutron stars make a large contribution to the production of heavy elements in the universe – in this case the so-called Lanthanides that include elements such as Terbium, Neodynium and the Dysprosium used in cellphones. And just like at the time of Merrill’s discovery, nuclear scientists around the world are scrambling, working overtime at their accelerators, to figure out what nuclear reactions could possibly explain all these new observations. Modern nucleosynthesis experiments, like those of the authors, are run on nuclear physics equipment including particle accelerators. National Superconducting Cyclotron Laboratory, CC BY-ND. Scientists are providing the clearest view yet of an intact bacterial microcompartment, revealing at atomic-level resolution the structure and assembly of the organelle’s protein shell. 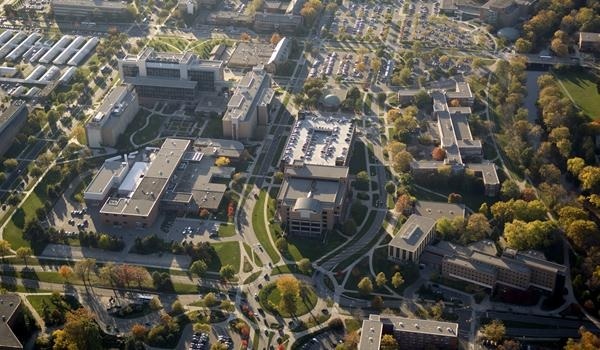 The work, led by scientists at the Department of Energy’s Lawrence Berkeley National Laboratory (Berkeley Lab) and Michigan State University (MSU), will appear in the June 23 issue of the journal Science. They studied the organelle shell of an ocean-dwelling slime bacteria called Haliangium ochraceum. These organelles, or bacterial microcompartments (BMCs), are used by some bacteria to fix carbon dioxide, Kerfeld noted. Understanding how the microcompartment membrane is assembled, as well as how it lets some compounds pass through while impeding others, could contribute to research in enhancing carbon fixation and, more broadly, bioenergy. This class of organelles also helps many types of pathogenic bacteria metabolize compounds that are not available to normal, non-pathogenic microbes, giving the pathogens a competitive advantage. The contents within these organelles determine their specific function, but the overall architecture of the protein membranes of BMCs are fundamentally the same, the authors noted. The microcompartment shell provides a selectively permeable barrier which separates the reactions in its interior from the rest of the cell. This enables higher efficiency of multi-step reactions, prevents undesired interference, and confines toxic compounds that may be generated by the encapsulated reactions. Unlike the lipid-based membranes of eukaryotic cells, bacterial microcompartments (BMCs) have polyhedral shells made of proteins. Earlier studies revealed the individual components that make up the BMC shell, but imaging the entire organelle was challenging because of its large mass of about 6.5 megadaltons, roughly equivalent to the mass of 6.5 million hydrogen atoms. This size of protein compartment can contain up to 300 average-sized proteins. The researchers were able to show how five different kinds of proteins formed three different kinds of shapes: hexagons, pentagons and a stacked pair of hexagons, which assembled together into a 20-sided icosahedral shell. The intact shell and component proteins were crystallized at Berkeley Lab, and X-ray diffraction data were collected at Berkeley Lab’s Advanced Light Source and the Stanford Synchrotron Radiation Lightsource, both DOE Office of Science User Facilities. The study authors said that by using the structural data from this paper, researchers can design experiments to study the mechanisms for how the molecules get across this protein membrane, and to build custom organelles for carbon capture or to produce valuable compounds. Other co-authors of the study are Basil Greber, an affiliate of Berkeley Lab’s MBIB division and a UC Berkeley postdoctoral fellow in the California Institute for Quantitative Biosciences, and Clement Aussignargues, a postdoctoral fellow at the MSU-DOE Plant Research Laboratory.